Sam Fiorella: Can You Be Influential While Under The Influence? The debate around influence scoring and measurement has once again reared its ugly head with a new series of articles written in Wired Magazine, Forbes and Social Media Examiner, among others. Mark Schaefer also published a book recently titled: Return on Influence, which presents the online influence tracking service Klout.com as the future of marketing: low-cost, high-speed, influence driven, and powerful. I’ve now had a well-documented history of highs & lows with Klout that eventually led me to declare my freedom from the self-serving, vanity-driven business and more recently, to create a public awareness campaign for those afflicted from fallout of opting out of Klout. As many have already quipped, there are few businesses or social media-related subjects that generate the amount of hate and public debate that Klout seems to inspire. However, this post isn’t about loving or hating Klout. It poses a question to those brands who have or who are considering paying Klout for access to their top ranked “influencers”. 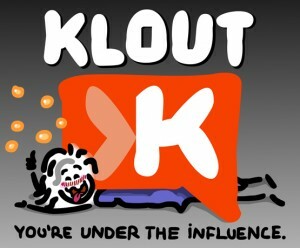 Can an individual influence others while they’re “under the influence” of Klout? The business of Klout.com is monitoring the quantity of social interactions one has with others, the nature of those online interactions and predicting the impact these individuals have on their social graph. Online interactions are churned through their proprietary algorithms to produce a ranking of Klout-decreed influencers on various topics using a score of 1 to 100. Brands then shell out top dollar to access these people and reward the elite with product trials and offers in hopes that the chosen will promote and encourage purchase of the brand’s product among those they supposedly influence. In other words influencer marketing; a concept and tactic that pre-dates Klout and even the Internet and social media for that matter. Now, I’ve been at the enterprise marketing game for almost 20 years and so this concept of engaging influencers is not new to me, in the offline or digital space. Yet I don’t understand the current fascination and blind trust that brands are placing in Klout. What I do know is that before Klout and their ilk became water-cooler fodder, influencers were held to a different standard. Their selection process required more accountability. CMOs demanded empirical proof of the candidate’s influence – and in many cases actual guarantees of the impact they’d deliver. Klout plays on these trends and promises brands they can connect them with those who will positively impact their business’s sales and profitability. If not, why would anyone pay top dollar to access the Klout-annointed? Is that blind faith well placed? 1. Klout is a game. Klout plays on the vanity of individuals through various gamification techniques, which encourages those individuals to change their social behaviours in order to receive the perceived clout and “perks” awarded to those who play the game well. The fact that the game can be, well, gamed should raise serious questions in the minds of brand marketers when considering this channel for their marketing strategy and budget. 2. Undefined Context. The context of the influence is loosely – if at all – defined. Of bigger concern, the fact that who is being influenced is even less defined. For example, the king of all influencers on Klout is Justin Beiber with a perfect game score of 100. Brands are rewarding high-scorers like him with upgrades on hotel accommodations or special privileges on airplanes. Upon receiving such a perk, the hope is that The Biebs will Tweet: “This is a great hotel, you should check it out” and his followers would flock. Given that his followers are predominately pre-teen girls, the likelihood that his advertisement will have his audience pulling out their credit cards seems unrealistic. Granted that Justin is an extreme example, the point is still relevant. Where’s the audience context that is demanded in any other form of marketing plan or budget allocation? 3. Troubled History. Their self-professed “standard in influence measurement” is based on experimental and frequently changing algorithms (anyone see the contraction here?) that have caused scores to dramatically jump or decrease over night. Just the fact that we’ve proven you can game your score would have scientists releasing their rats and refocusing on another hypothesis. Yet marketers continue to believe, or maybe it’s hope? What I believe this all boils down to is: if the individuals that Klout is selling access to are playing the game, tweeting whenever and whatever it takes to increase their score, limiting their conversations to only those that are more influential than them…are they really influencing anyone? Can you count on those people to be honestly and genuinely influential if they’re “Under the Influence” of the Klout game? Originally published 10 July 2012 on Business 2 Community. Sam Fiorella is a Partner and Chief CX Strategist at Sensei Marketing and can be followed on Twitter @samfiorella.